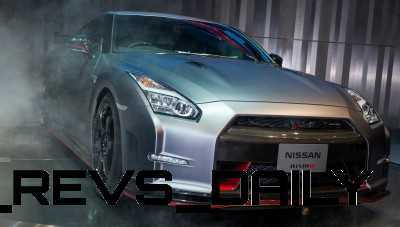 2015 GT-R + GT-R NISMO Official Debut! 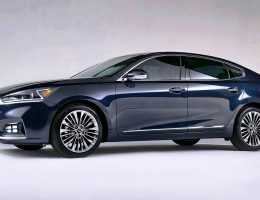 Now Far More Beautiful, Luxurious… and EVEN FASTER! 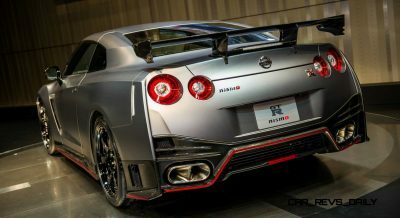 The next GT-R just debuted in Tokyo, and boy is it magnificent. A beautiful vision in anthracite grey. 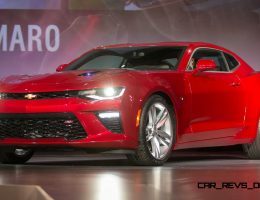 Hugely redesigned surfaces appear all over the exterior, with the nose and grille graphic perhaps the most improved versus the current car. All-new LED lighting is featured throughout, finally bringing the GT-R’s styling up to the same caliber as its world-beating performance. 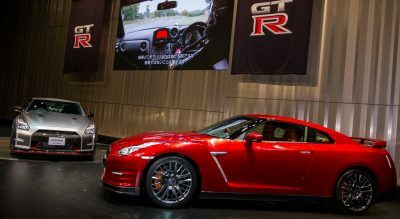 The evolution of the 2015 GT-R brings much of the revised technical solutions from the brand-new 2014 Nissan GT-R NISMO — but wraps the enhancements in that far prettier exterior and now, even a lavish interior. The Infiniti ‘leathers and padded surfaces’ team has gone to town on the 2015 GT-R’s cabin. Just in time too: the Corvette Stingray is hot on its trail both in tech, style and interior ambiance. There can be only one! 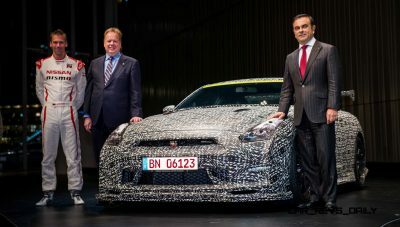 And it is the 2015 Nissan GT-R.
YOKOHAMA, Japan – Evolution never stops for the Nissan GT-R. Nissan’s iconic sports car brings a refreshed vision of “innovation that excites” with the introduction of the 2015 (in the U.S.) model offering a new level of sophistication, yet with no compromise in performance. 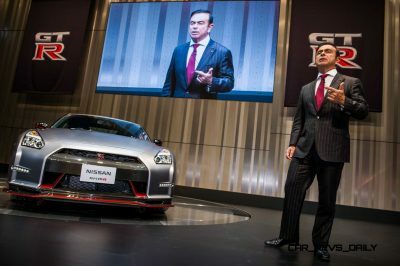 The sales of Nissan GT-R begin in Japan on December 2, to be followed by sales at Nissan dealerships in other markets worldwide. 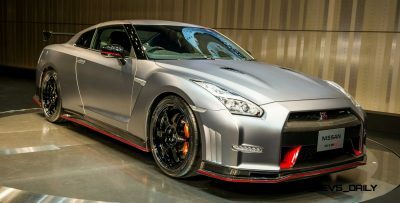 The 2015 Nissan GT-R offers smoother ride comfort, more refinement and benchmark fit and finish, in the spirit of a great “GT,” while delivering breathtaking performance and road-holding. 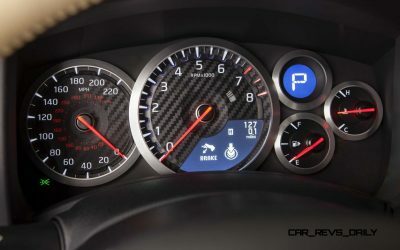 Its “multi-dimensional performance” means the driver can enjoy the full depth of the GT-R’s capabilities, whether navigating corners of a winding mountain road, cruising on the highway or even in an urban environment. 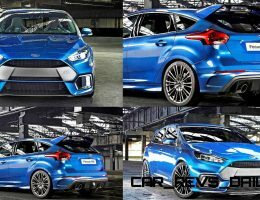 The suspension was fine-tuned to reduced load fluctuation between the four wheels, giving better stability and more consistent grip. More constant tire contact is achieved by optimized electronic control of the shock-absorber valves, as well as modified front stabilizer spring rates and updated bush link. 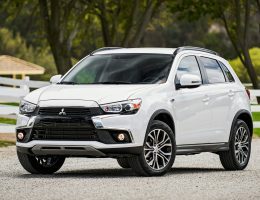 The tuning of these parts, which makes best use of the suspension strokes and enhances road-holding capability, gives a poised, confident ride and outstanding traction on rough roads. With minute vibrations and road noise reduced, a relaxing, comfortable ride is assured. An additional benefit is improved straight-line stability, with fewer small steering corrections needed to maintain the correct trajectory during highway driving. The braking calibration has been retuned for a more firm, linear response at everyday speeds, making smooth braking more intuitive, generating greater confidence, particularly in wet conditions. 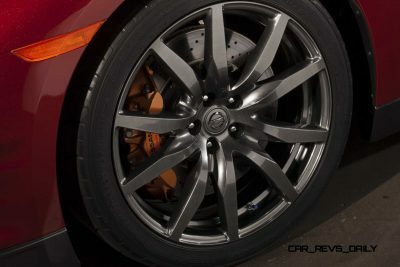 The GT-R’s steering has been fine-tuned to reduce the effort required for in-town maneuvers, while maintaining its exceptional feedback during high-speed driving. The combination of retuned suspension and exceptional steering feel give outstanding confidence at high speed. The 2015 Nissan GT-R maintains its position as one of the most striking supercars in the market. 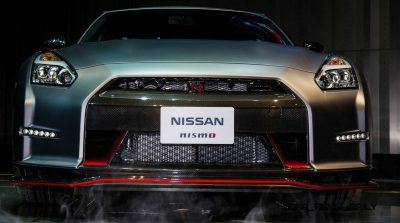 Significant updates to the Nissan GT-R’s lights both enhance the visual impact of the car. Customers looking for added visual impact now have a wider color palette to choose from. The 2015 Nissan GT-R sports new efficient, high-intensity, multi-LED headlights that create a distinctive “lightning” motif, generating a striking exterior visual signature. 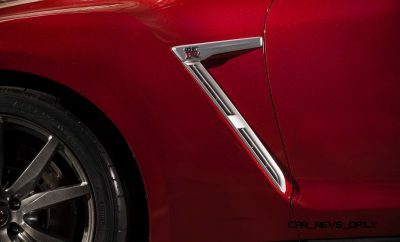 With such a unique visual reference, the GT-R’s road presence is enhanced, particularly in low light and at night – while the fitment of the new headlights gives the driver increased visibility. 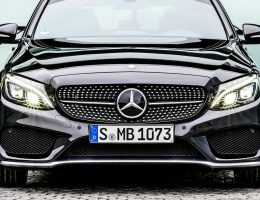 The new headlights feature AFS (Adaptive Front lighting System*) that automatically adapts the angle of the light beam according to the speed of the car. 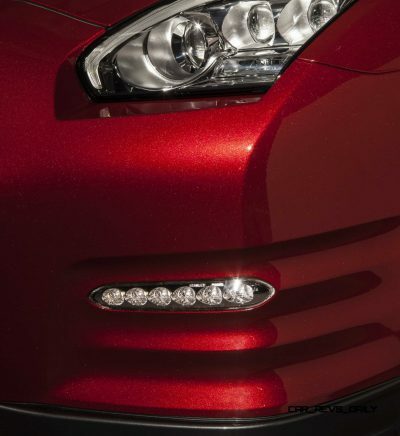 At highway speeds, actuators in the headlight unit adjust the angle of the projectors to project the light further. The four LED units are configured with new intensive LED high beam and three different LED low beams including long-distance-illumination and wide-illumination. 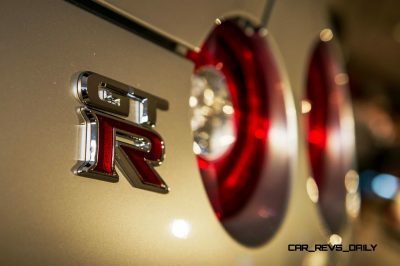 At the rear, the GT-R’s distinctive four-ring tail light signature now forms coherent circles of illumination, giving the GT-R an equally distinctive appearance, making it easily recognizable to fellow owners and enthusiasts. Upon start up, the full new lighting signature is illuminated, creating a dramatic start-up procedure. Visual appeal is reinforced with the addition of a new body color called Gold Flake Red Pearl. As its name suggests, there are microscopic gold-tinted glass flakes infused into the red paint, creating a spectacular effect in the deep, lustrous paint as the light catches the finish. Choice of three interior color schemes includes a new pale ivory trim option. 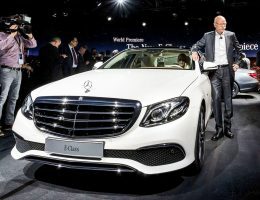 The steering wheel is trimmed in leather, for premium tactility, while the part-aniline leather seats are further embellished with stitched accents, giving the ambience of a genuine GT designed for cross-continental, first-class travel. 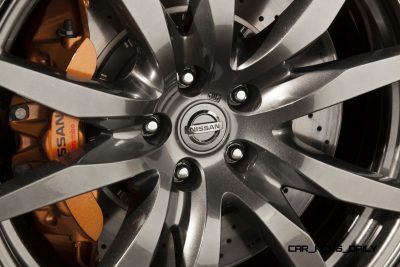 To achieve the project’s ambitious targets for high-speed handling and ride comfort, Nissan enhanced the level of precision-constructed body elements and advanced assembly methods to create the 2015 Nissan GT-R.
Each part is made of materials selected for optimum performance: Precision-constructed, multi-material hybrid body combines steel, carbon fiber and die-cast aluminum to achieve high stiffness and light weight. 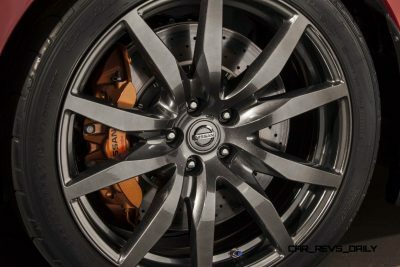 Thanks to the rigidity of the GT-R’s body construction, suspension precision is guaranteed while refinement is enhanced, resulting in exceptional cabin refinement even at high speeds and under hard cornering. Thanks to optimized insulation and acoustic tuning, even at high speeds, the occupants are able to enjoy the sporty engine sound. An optional carbon rear wing is offered, which is attached to a carbon trunk lid, giving a weight saving of half compared with the standard trunk lid. 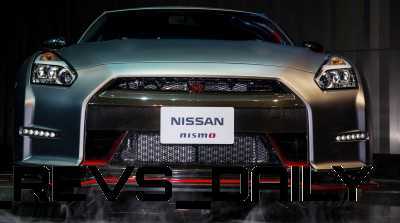 Nissan Motor Co., Ltd., Japan’s second-largest automotive company, is headquartered in Yokohama, Japan, and is part of the Renault-Nissan Alliance. 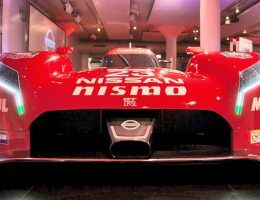 Operating with approximately 236,000 employees globally, Nissan sold more than 4.9 million vehicles and generated revenue of 9.6 trillion yen (USD 116.16 billion) in fiscal 2012. 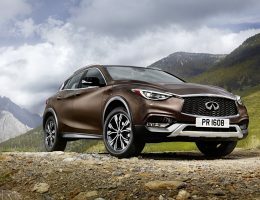 Nissan delivers a comprehensive range of over 60 models under the Nissan and Infiniti brands. In 2010, Nissan introduced the Nissan LEAF, and continues to lead in zero-emission mobility. The LEAF, the first mass-market, pure-electric vehicle launched globally, is now the best-selling EV in history.